Open the ireps login page and click on the link 'Click Here To Get Password Through E-mail' available under 'Forgot Password' block. Enter your registered email id (which is you user id) and press the submit button. 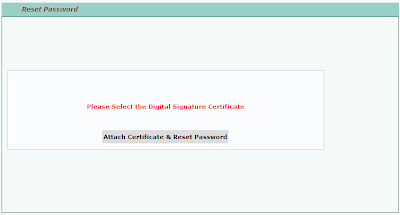 After that attach you Digital Signature Certificate by clicking on 'Attach Certificate and Reset Password' button. 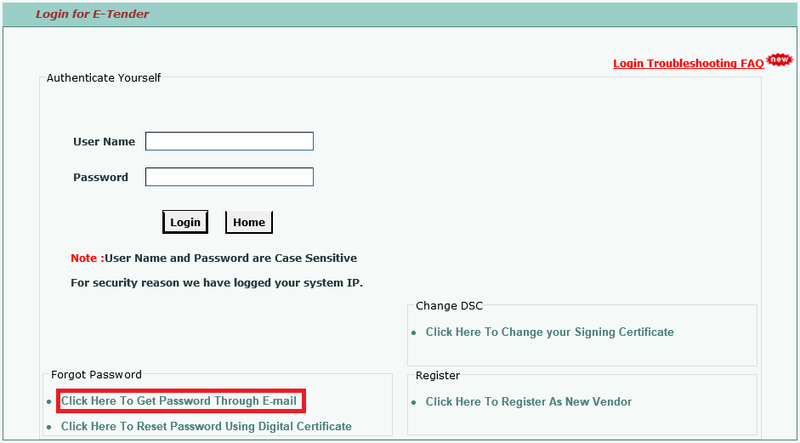 Check your E-mail for new login password and logon to www.ireps.gov.in with the new password. 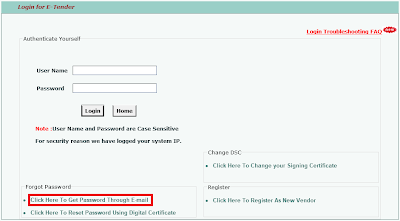 Open the ireps login page and click on the link 'Click Here To Reset Password Using Digital Certificate' available under 'Forgot Password' block. 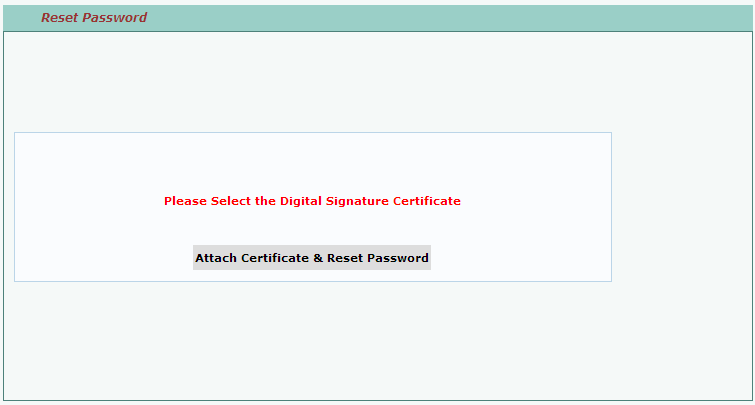 After that attach you Digital Signature Certificate by clicking on 'Attach Digital Signature Certificate & Change Password' button. Enter the new password and click on 'Save' button. 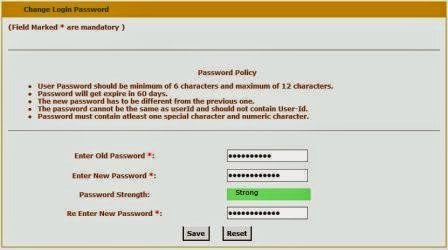 Your password has been reset and now you can log in with the new password on www.ireps.gov.in. IREPS password policy says that your password will get expire in 60 days, it means after 60 days from last password change users automatically will be prompt to change their password. Users can change their password anytime after login through the link "Change Password" available in right navigation under My Profile block on logged in users home page. Enter the current and new passwords and click on save button to change the password. As per IREPS guidelines you have to wait for at least 3 days to get your registration request approved or disapproved. Currently IREPS is working only on Windows Operating System and Internet Explorer Browser. So you need a PC or Laptop with Windows OS and Internet Explorer to change the password and to login into ireps web application. i am a new user on ireps. my DSC has been done with my personal email id. While registering as a new vendor can i change the email id with the company's email id? login time, how do i change the pin? Do you want to change your login password? If you know the password then you can change it after login through change password link. If you have forgot your password then you can change your password by using any method described in this post. I wanted to know that while registering as a new contractor on ireps can the email id be changed? My DSC has been done through my personal id, can it be changed with the company's email id while registering as a new contractor? Yes, you can edit/change your email id while submitting your registration form. Thanks Sir for your reply. I also wanted to know that the address of the company and the address of the user id can be different from each other. My office address and my personal address (home) are different. Do the addresses to be provided have to be same? No, it's not mandatory that addresses should be same. Firm's address and user's address may be different. Please note that E-Mail ID entered will be used as user name, and once the registration is done it is not possible to change the user name. First you need to register yourself as a vendor on IREPS web portal (www.ireps.gov.in) to participate in the tenders published by Indian Railways. Search the related tenders in which you want to quote and submit your quotation. While creating a user on IREPS erroneously I have attached Admin certificate instead of user certificate. Now User is unable login in IREPS. please suggest how change DSC or delete perticular user. 1. Log in as an admin user on IREPS website. 2. Click on View My Account Profile link available in the right navigation block under My Profile. 3. Now click on Add Remove Members button. 4. You will see the list of all users under your account. 5. Click on delete icon if you want to delete a particular user or member. 6. If you want to change the change the certificate of a user then click on edit icon corresponding to that user. 7. Check the Change Certificate checkbox and click on Sign and Submit button. 8. 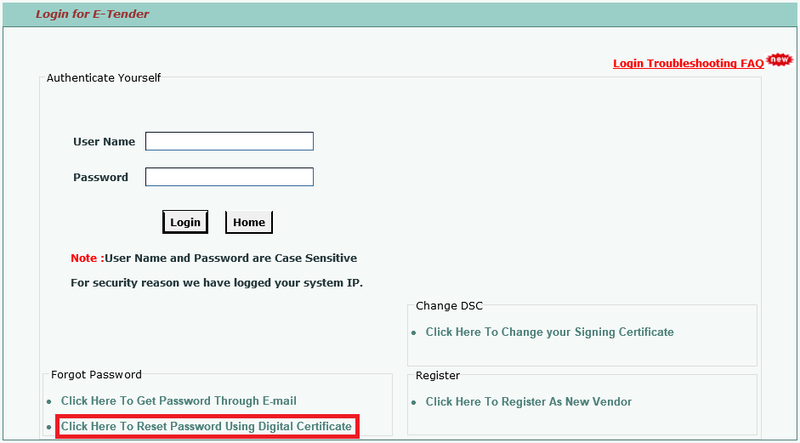 You will be asked to select the new DSC for the selected user, select certificate and submit, Certificate will be changed. 9. Now that user can login with the new certificate. 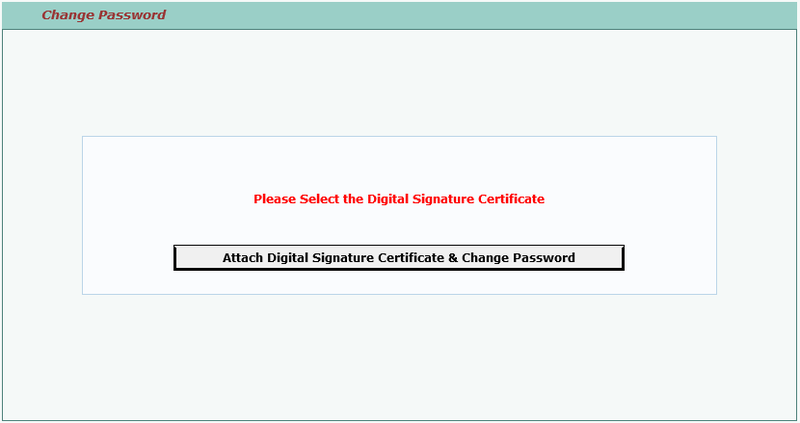 I have lost my existing digital signature and obtained a new digital signature certificate. How do I iregister it on IREPS portal. You can submit a request to IREPS Helpdesk to change your digital Signature Certificate. Click on Link given below to see the complete process.